When it comes to sleep training your baby, the variety of options can seem overwhelming. Every baby and parent has a different situation, so it’s important to pick and stick to a method which works for you both. One popular baby sleep training method is known as the “Cry It Out” method. Here we explore the history of this method, alongside its benefits and drawbacks, plus tips for how to make it most effective. Note: The articles presented on the Sleepopolis blog are for informational purposes only. Please consult with your child’s healthcare professional before undertaking any new sleep training methods or any new sleep hygiene practices for your child. The Cry It Out method was originally conceived in Dr. Emmett Holt’s 1895 book The Care and Feeding of Children. It was widely popularized by Dr. Richard Ferber in his book Solve Your Child’s Sleep Problems first published in 1985. This book garnered so much attention that today the method is sometimes referred to as Ferberization. A common misunderstanding of the Cry It Out method is that it refers to simply leaving your baby in its crib until they fall asleep. Actually, theCry It Out method recommends leaving the baby to cry for a (usually fairly short) period of time before intervening to offer comfort and attention. The key thought behind the Cry It Out method is that some amount of crying is an inevitable part of sleep training, and that trying to avoid tears at all costs will prevent proper sleep training for the baby. The method also aims to help your baby learn to fall asleep on their own, without cuddling, rocking and the comforting presence of a parent. If a baby becomes accustomed to falling asleep only with assistance from a parent, if they wake up in the night they’re likely to require the same amount of attention in order to drop off again. In this theory, the cry from the baby is not actually an explicit indicator that something is wrong – rather it’s a call to the parent to let them know they’re needed again. The reason this is problematic is because a natural sleep cycle causes a few instances of waking up briefly throughout the night – and thus the baby will be crying fairly frequently, too. Although some parents report finding the cry it out method difficult and even traumatic, the theory is that a short time of discomfort will pay off in the long run. Again, it’s worth noting that this sleep training method may not be ideal for every baby and their parents. FAQ: What’s the Best Mattress for Couples? The cry it out method works best on a slightly older, more independent baby – usually around four to six months old. The age at which they’re ready can vary massively from child to child, so Ferber doesn’t actually specify. If you try out the method and encounter too much struggle, it may be best to postpone until the child seems more emotionally ready. The steps of the cry it out method are as follows. Step One – Put the baby in their crib or bed, whilst they’re awake but seem sleepy. Step Two – Say goodnight and leave the room. Step Three – If the baby cries, wait for a short amount of time, then re-enter the room. Do not pick up the baby – just offer comforting noises and pats. Leave again while the baby is still awake, even if they are still crying. 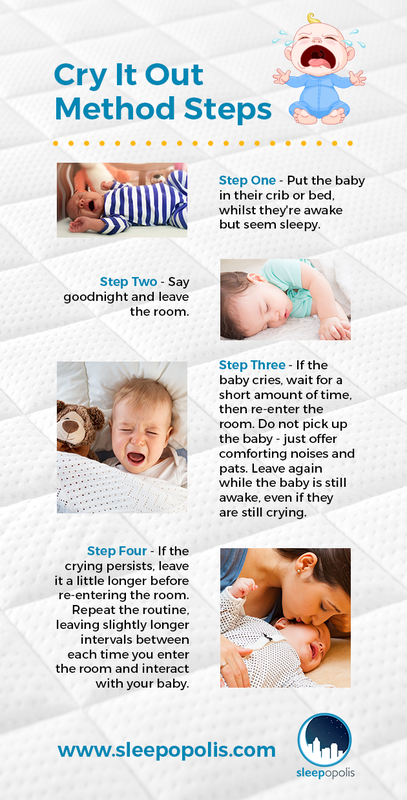 Step Four – If the crying persists, leave it a little longer before re-entering the room. Repeat the routine, leaving slightly longer intervals between each time you enter the room and interact with your baby. 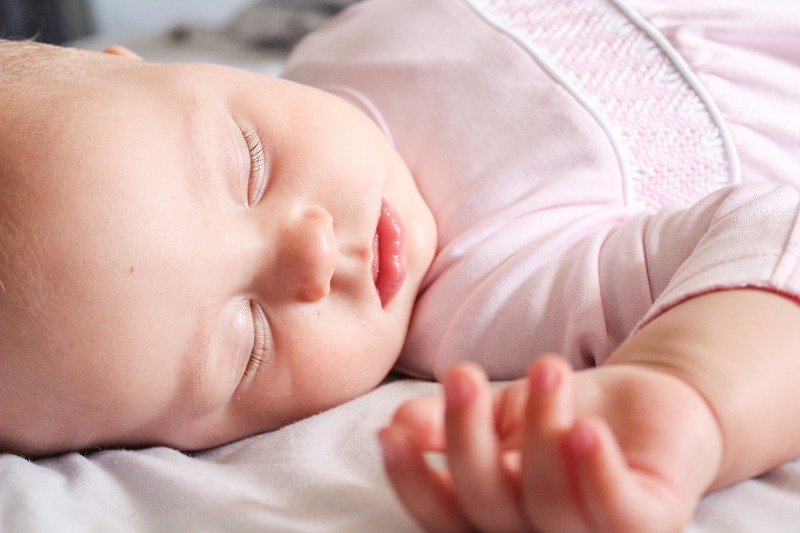 According to Ferber, it should only take between three and seven nights before your baby will be able to fall asleep naturally and on their own. If after a week you’re still struggling, it’s advised to wait for a few weeks then try again. The key to the success of the cry it out method is consistency. Knowing the amount of time to wait in between checking on your baby is hugely important. The recommendations are to begin with a three minute wait, then five, then ten. On the second night, start with five then ten, then twelve. As each night progresses, make the initial interval longer and extend from there. However, these intervals, along with the Cry It Out method itself, are just guidelines. If you have any questions or worries in regard to baby sleep training, it’s best to talk to your child’s healthcare provider immediately. It’s important to choose times your feel comfortable with, but also to stick to them and to extend them over time. Potentially Causes Babies Less Stress. A recent study found that babies sleep trained with the cry it out method have less cortisol (a stress-linked hormone) than those trained with other methods. Babies Fall Asleep Faster. After a week of the cry it out method, babies tend to be able to fall asleep in under fifteen minutes. Good For Parents. The combination of knowing exactly when it’s right to check on the baby combined with the overall higher amount of sleep means parents who are implementing the method are less stressed, anxious and sleep deprived. Lack Of Proof Of Negative Social And Emotional Effects. In spite of what some may think, there is generally little evidence that cry it out trained babies have any differences in social skills or emotional state than other babies. But again, the research isn’t conclusive. Parent-Child Relationship Issues. Some claim that the first two year of a child’s life establishes a lot of the relationship they’ll have with their parents, forever. Since crying is an admission of emotional vulnerability, it can be argued that this not being met with affection and comfort can cause issues. Problems For The Parent. Parents implementing the cry it out method may feel they are overriding their instincts by ignoring the cries of their baby. It can be extremely difficult for parents, and even cause them to lose trust in themselves as caregivers. Some people claim that leaving a child to cry in their perceived time of need can cause damage to the child and the parent-child relationship. A baby may feel more unsafe and could be traumatized by this early memory. There are also arguments that leaving a baby to cry in its most vulnerable moment can cause problems and divisions between the parent and child, making their relationship most distant and less healthy. However, those who advocate the cry it out method generally claim that implementing the method in an otherwise close, healthy and supportive relationship should be without any adverse effects. It’s best to talk to your child’s healthcare provider if you have any doubts or concerns about which sleep habits to work toward. The two main alternatives to the cry it out method are called the no tears method and the fading method. The no tears method is in direct opposition to the cry it out, while the fading method is somewhat of a hybrid of the two. The no tears method was established in response to the cry it out method, by families for whom it hadn’t worked. It relies on a fairly quick response by parents to any crying by their baby. The fading method acts as a bridge between the two methods – the parents gradually diminishes or “fades” their role in helping their baby get to sleep. Advocates say it promotes independence of the baby while allowing a trusting and close relationship between parent and child. A study by the university of Adelaide showed that both the cry it out and the fading method had a positive impact on a child’s ability to fall asleep. The same study showed sleep trained babies had lower levels of cortisol, the stress hormone. An earlier study at the same university found that after six years, here doesn’t seem to be a huge amount of difference between sleep trained and non sleep trained kids – supporting the hypothesis that the best sleep training method is the one which works for you. Get Into A Routine. The best way to get your baby comfortable with any sleep training method is to get them into a good night time routine. Have a few steps that signal to your baby that it’s nearly bedtime, like a bath, a bedtime story and a lullaby. This will help mentally prepare your baby for their coming bedtime, and thus they less likely to be taken by surprise and upset by it. Prepare And Plan. Know that the first few nights of the cry it out method are likely to be tricky. You’ll probably lose a little sleep, so for those who work weeks, it might be a good idea to begin the program on a Friday. Try as best you can to emotionally prepare yourself for the tricky first nights, too. Stick With It. The main reason for failure of the cry it out method is parents giving up too quickly. While leaving your baby to cry can be irritating and even traumatic, undoing all your hard work by giving up will mean it’s all for nothing. Accept Some Early Difficulty. Not only will the cry it out method be difficult, sometimes you’ll find it impossible. Forgive yourself for early relapses and try to get back into routine as quickly as possible. Adapt The Method To Fit You. If the idea of three minutes of crying seems unfeasibly long, wait for fewer minutes before checking in. If you want to stretch the trajectory out and try to train over two weeks instead of just one, that’s fine too. Make the method work for you, rather than the other way around. Environmental Home Remodeling for your Bedroom, Kitchen and Beyond!